40 and ¾ years after Martin Luther King Jr. was assassinated, Barack Hussein Obama prepares for his inauguration as the 44th President of the United States of America. King was just 39 when he was gunned down, which means he has been dead longer than he lived. Like King, the 47 year old Obama already touts a monumental legacy. Certainly, both men can be accredited for making remarkable strides for black Americans. One might even go so far as to say that, without the contributions of Martin Luther King, Barack Hussein Obama may not have had the opportunities he’s had to put himself in position to become our next president. It seems fitting, then, that we look at the parallels and dissimilarities between King and Obama. It’s imperative that we look deeper than their skin pigment to make these comparisons. As MLK said during his speech at the Lincoln Memorial, “I have a dream that my four little children will one day live in a nation where they will not be judged by the color of their skin but by the content of their character.” So let us not simply compare them by virtue of their both being influential black men; let's instead compare them as human beings. Both men had different names than the ones by which they are most commonly referenced. Martin Luther King’s birth certificate indicates that he was born “Michael King” in 1929. King’s father later changed the name from “Michael” to Martin Luther, in honor of the historic religious reformer. Obama was born “Barack Hussein Obama,” but while attending school in Indonesia, his school records indicate that his name was “Barry Sotero,” taking the last name of his step-father. Interestingly enough, neither Obama nor King have any legal records of any name change whatsoever. Both men were politically accosted by their advisories for being “socialists” or “communists.” Certainly, neither man promoted the establishment of an egalitarian, classless, stateless society – per se. However, both had questionable ties to communist organizations and both promoted economic and political theories advocating a change in government whereby the economic burden of the country would be bared by the collective and/or the government – a tenant of socialism. Obama’s ties to communism can be found in his relationship with the “New Party.” When Barack Obama successfully ran for the Illinois State Senate in 1996 (as a Democrat) he was endorsed by the Democratic Socialists of America (DSA). Two organizations formed the backbone of the New Party: The Democratic Socialists of America and the Association of Community Organizations for Reform Now (ACORN). In Obama’s hometown of Chicago, the “New Party” consisted mainly of ACORN, DSA and the Committees of Correspondence (CoC). A breakaway from the Communist Party of America, the CoC worked closely with the DSA for years. The New Party began endorsing Obama in 1995, and its members continued doing so years after the party officially dissolved; hence the overwhelming support for Obama from organizations like ACORN. Among New Party members was linguist and radical activist Noam Chomsky. Obama is the only major presidential candidate to have ever sought and received the political endorsement of a communist organization. The New Zeal blog dug up print copies of the “New Party News,” the party's official newspaper, which show Obama posing with New Party leaders, list him as a member of the New Party, and include quotes from him. Visual proof can be seen here, and commentary can be found here, here, and here. This infamous photo was taken on Labor Day 1957, at a Communist training school (Highlander Folk School) at Monteagle, Tennessee. 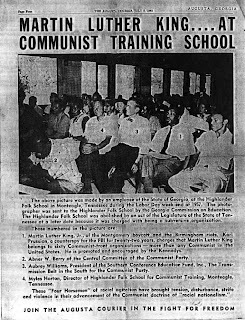 Here, King is sitting with three well known Communists: Abner W. Berry (a member of the Communist Party’s Central Committee); Aubrey Williams (a board member of a Communist front group and a member of various Communist-front organizations); and Myles Horton (the school’s director). (Information provided by: MartinLutherKing.org, Don Boys, Ph.D., and FreeRepublic.com. Ironically enough, Obama and King’s political ideologies were similar, but they registered with different parties. Believe it or not, according to the National Black Republicans Association, King registered with the Republican Party in 1956. Despite King’s niece’s testimony, there appears to be no documentation of King’s party registration. However, the assertion that he was a Republican isn’t a stretch given the context of the time. It was Republican President Dwight Eisenhower who pushed to pass the Civil Rights Act of 1957 and sent troops to Arkansas to desegregate schools. While liberals laud John F. Kennedy as a proponent of civil rights, he voted against the 1957 Civil rights Act while he was a senator. After becoming president, Kennedy, through his brother (Attorney General Robert Kennedy), had King wiretapped and investigated by the FBI on suspicion of being a Communist. Given the circumstances of that time, it is understandable why King followed in the footsteps of his father and became a Republican. Obama is clearly not a Republican. By contrast, the National Journal rated Obama as the most liberal senator in Congress. 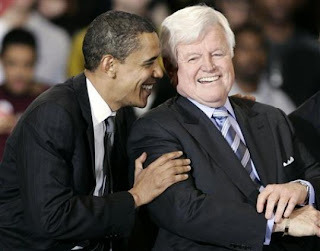 It seems pertinent at this time to compare King and Obama's relationships with the Kennedy family. As noted above, it was JFK who had Robert Kennedy investigate King. 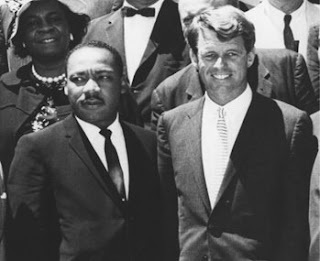 As you probably already know Robert Kennedy and Martin Luther King were assassinated within the same year (five years after the assassination of John Kennedy). Before JFK was elected President, he used his influence to help get King out of jail. The move helped Kennedy garner more black American support and, arguably, helped him attain the less than 1% victory over Nixon. 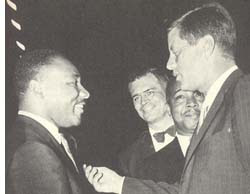 Despite the fact that King was openly critical of JFK's administration, the two corresponded frequently regarding civil rights issues. 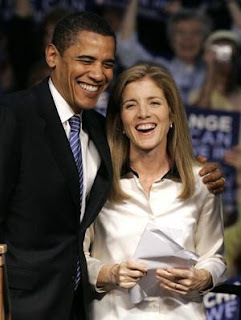 And supporting the placement of unqualified Caroline Kennedy into the New York senate seat being vacated by Hillary Clinton (Obama's selection for Secretary of State). Another attribute which these two historical figures share in common is plagiarism. As a Boston University Graduate student, I took particular pride in knowing that my university had once hosted the mind of Martin Luther King as he attained his Doctorate… that is until I learned that he had plagiarized large portions of his doctorate thesis. King's doctoral dissertation, "A Comparison of the Conceptions of God in the Thinking of Paul Tillich and Harry Nelson Wieman," for which he was awarded a PhD in theology, contains more than fifty complete sentences plagiarized from the PhD dissertation of Dr. Jack Boozer, "The Place of Reason in Paul Tillich's Concept of God." According to "The Martin Luther King Papers", in King's dissertation, "only 49 per cent of sentences in the section on Tillich contain five or more words that were King's own...."
Apparently, King’s plagiarism wasn’t limited to his doctoral thesis. The first public sermon that King ever gave, in 1947 at the Ebenezer Baptist Church, was plagiarized from a homily by Protestant clergyman Harry Emerson Fosdick entitled "Life is What You Make It," according to the testimony of King's best friend of that time, Reverend Larry H. Williams. The first book that King wrote, "Stride Toward Freedom,” was plagiarized from numerous sources, all unattributed, according to documentation recently assembled by sympathetic King scholars Keith D. Miller, Ira G. Zepp, Jr., and David J. Garrow. And no less an authoritative source than the four senior editors of "The Papers of Martin Luther King, Jr" (an official publication of the Martin Luther King Center for Nonviolent Social Change, Inc., whose staff includes King's widow Coretta), stated of King's writings at both Boston University and Crozer Theological Seminary: "Judged retroactively by the standards of academic scholarship, [his writings] are tragically flawed by numerous instances of plagiarism.... Appropriated passages are particularly evident in his writings in his major field of graduate study, systematic theology." King's essay, "The Place of Reason and Experience in Finding God," written at Crozer, pirated passages from the work of theologian Edgar S. Brightman, author of "The Finding of God." Another of King's theses, "Contemporary Continental Theology," written shortly after he entered Boston University, was largely stolen from a book by Walter Marshall Horton. Reading Garrow's article, one is led to the inescapable conclusion that King cheated because he had chosen for himself a political role in which a PhD would be useful, and, lacking the intellectual ability to obtain the title fairly, went after it by any means necessary. Why, then, one might ask, did the professors at Crozer Theological Seminary and Boston University grant him passing grades and a PhD? Garrow states on page 89: "King's academic compositions, especially at Boston University, were almost without exception little more than summary descriptions... and comparisons of other's writings. Nonetheless, the papers almost always received desirable letter grades, strongly suggesting that King's professors did not expect more...." The editors of "The Martin Luther King Jr. Papers" state that "...the failure of King's teachers to notice his pattern of textual appropriation is somewhat remarkable...."
But researcher Michael Hoffman tells us "...actually the malfeasance of the professors is not at all remarkable. King was politically correct, he was Black, and he had ambitions. The leftist [professors were] happy to award a doctorate to such a candidate no matter how much fraud was involved. Nor is it any wonder that it has taken forty years for the truth about King's record of nearly constant intellectual piracy to be made public." Supposed scholars, who in reality shared King's vision of a racially mixed and Marxist America, purposely covered up his cheating for decades. The cover-up still continues. From the "New York Times" of October 11, 1991, page 15, we learn that on October 10th of that year, a committee of researchers at Boston University admitted that, "There is no question but that Dr. King plagiarized in the dissertation." However, despite its finding, the committee said that "No thought should be given to the revocation of Dr. King's doctoral degree," an action the panel said "would serve no purpose." Obama has had his own battles with plagiarism. On February 16, 2008, he gave a speech in Wisconsin where he responded to allegations from Hillary Clinton that all he had to offer was “just words”. However, Obama’s speech was remarkably similar to a 2006 speech delivered by Massachusetts Governor Deval Patrick. As a fellow black democrat, Patrick, of course, came out ex post facto and claimed that he had given Obama permission to use his speech. Obama’s vice president, Joe Biden, had his 1987 presidential bid cut short because he too got caught plagiarizing - a television ad by former British Labor leader Neil Kinnock and speeches by Robert F. Kennedy and Hubert H. Humphrey (WeeklyStandard). Granted, MLK and Biden’s plagiarisms appear to be far more involved and egregious than Obama’s. But the comparison still stands. Moreover, Obama’s thesises and school essays cannot be reviewed because (like his birth, travel, adoption, name change, and medical records) he refuses to make them public. Between Obama refusing to release most of his records and King’s files being sealed until 2027 – we find yet another similarity. Immediately following his election, suggestions began circulating that Obama should get his own National holiday. As you should well know, King already has a national holiday declared in his honor; a holiday which will ironically be celebrated this year on the eve of Obama’s inauguration. The honor of a national holiday is one accorded to no other American: not George Washington, not Thomas Jefferson, and not Abraham Lincoln (Washington and Lincoln no longer have national holidays, our great presidents all share the same generic "President's Day"). Given the context of the comparison between these two men, I find the extent to which this country has been willing to glorify both of them dishonest and appalling. It’s shameful to me that I received a majority of my grade school education in the home state of Martin Luther King (Georgia), but never heard King was an adulterer, plagiarizer and had communist ties, until now. My concern is that, like King, Obama is being glorified and deified. He wasn’t properly vetted before the election, and if history’s treatment of Martin Luther King is any indication, Obama will never be properly vetted. It seems that he will be given a free pass on his vices simply by virtue of his skin color and the resulting novelty of his election. Martin Luther King was instrumental in the progression of equal treatment for black Americans. For his accomplishments in that arena (and, it seems, in that arena alone) he deserves recognition. But Martin Luther King Day has somehow been turned into a day of fornication between the main stream media and King’s legacy. 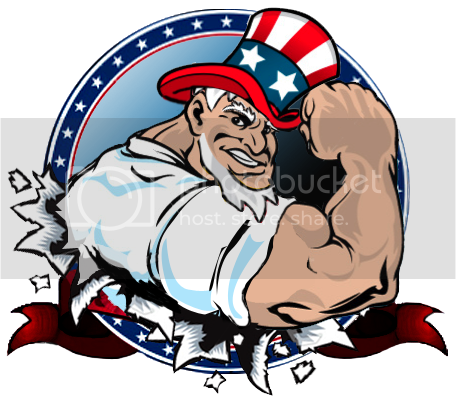 As with their sculpting of King’s legacy, the media seem all too eager to mold Obama into the epitome of Americana. His faults and his shady past have been cast aside, there is no call of outrage for him to release his records, his resume is dangerously thin – and he’s about to inherit two wars and an economic recession. I fail to see why anyone would be excited about his impending presidency. Apprehensive, perhaps, but certainly not excited. Hopefully, unlike King, Obama will live past his popularity and, at some miraculous point in time, actually be judged by “the content of his character” rather than “the color of his skin.” I fear all the media need to cement their portrait of this new Camelot, is for someone to martyrize Obama before he has a chance to fail. how important to remember history. Who passed the civil rights act and ended slavery? Republicans. Who worked against it? Dems. But who has the credit? Dems. Because the media tells us what to believe and what to think. This is the "American Idol" election. This American Idol will not be ALLOWED to fail in our minds. Whatever he does right, will be exaggerated and overblown. Whatever he does wrong will be brushed under the table of unreported OR deemed as "George Bush's fault" Obama on our currency AND on Mount Rushmore seems almost a certainty and the man has not even taken office. Folks, this is very scary. Govenment is about to get even bigger and it's our children who will inherit these debts.